Precision guided "smart" weapons have become the munition of choice for advanced militaries throughout the world. The ability to efficiently and effectively perform functional electronic testing on these complex optical guidance devices is necessary to maintain high mission readiness by ensuring proper performance and safe operation. Universal O-Level armament test set capable of testing both legacy and "smart", MIL-STD 1760-based, weapons systems used on military aircraft. Supports multiple Operational Flight Profiles (OFP) in a hand-held unit. State-of-the-art portable test set for the AGM-65 Maverick missile system and for AGM-114 missiles. The MTS-206A combines the test capabilities of an I-Level test set in a compact, rugged enclosure suitable for field use. Designed to replace legacy simulators while providing significantly upgraded capabilities, the MTS-916 provides comprehensive I-level test capabilities for laser, TV, IR and CCD seekers. Technically-compliant and an easy-to use, best-value solution, the MT1888 offers simple, O-Level Laser Guided Missile seeker testing. 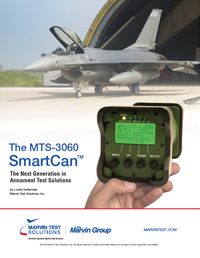 Marvin Test Solutions understands the needs of both warfighters and maintenance personnel. From the flightline to the depot, our range of cost-effective, technologically advanced solutions that support mission critical systems is unrivaled in the industry. 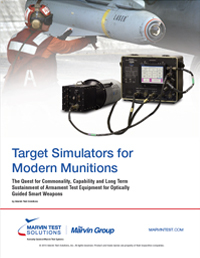 For more information, please register to download the whitepapers "Target Simulators for Modern Munitions" and "MTS-3060: The Next Generation in O-Level Armament Test."